Entertaining & Educational Programs for Young Children in Philly Area! 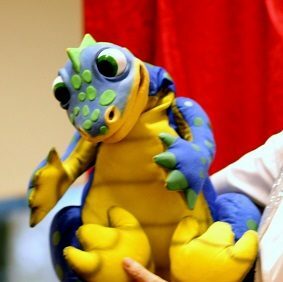 Looking for Great Entertainment for Young Audiences? Welcome to Giggle Magic! 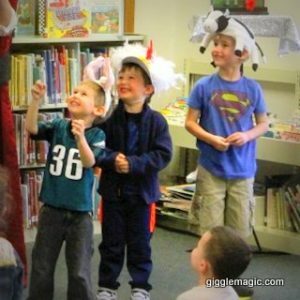 Philadelphia Area’s Go-to Edutainment for Preschools, Kindergarten Classes, Libraries and Community Events! 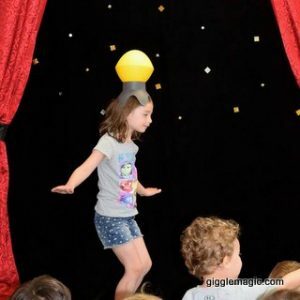 Giggle Magic rivets young audiences with a fun-filled variety show! 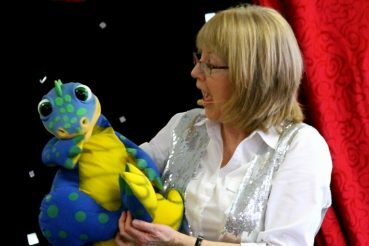 Within seconds the children are giggling, engaged, and off on a journey comprised of age-appropriate magic, puppets and slapstick comedy. Then it’s time to get up and move to a Kidz-Rock Dance Party! Always fun; always educational! Giggle + Magic = Awesome Entertainment! 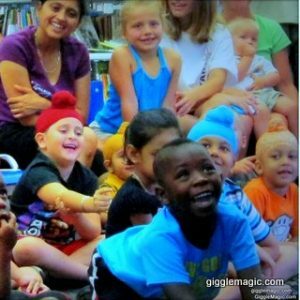 Giggle Magic is geared for 2 to 7 yr olds - Those who love to giggle and their families! The program is packed with …Themed Magic …Comedy …Music …and Puppetry. 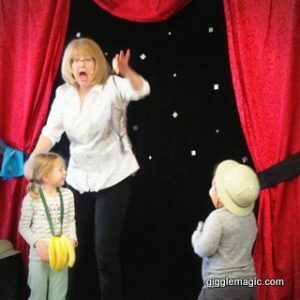 Giggle Magic incorporates “the silly” into each and every trick and routine and this is what captivates young audiences. All the children participate as we cheer, count, do hand motions and BELLY LAUGH! The laughter is non-stop because the little ones get the magic and comedy. Then they “move it, move it” at the post show Kidz-Rock Dance Party. Plan for a total of 50 -60 minutes of entertainment! Discover gravity and the wackiness of a Giggle Magic show! Even the youngest of children will soon understand that what goes up must come down, but when it’s coming…now that is another story! What fun the kids have when The Cat in the Hat’s gloves shrink…and then grow… and then change colors right before their very eyes. And there goes Thing One – he’s disappeared again! Little Miss Muffet and Bakery Bear encourage young audiences to choose healthy foods and drinks. Bakery Bear has a sweet tooth - DON'T LET HIM SNEAK OFF TO THE BAKERY! So much yummy fun! Princess Petunia (Cinderella’s BFF) gets ready for the ball – turns out she’s not “the fairest of them all!” Prince Harry dreams of being a Knight in Shining Armor, but he turns into a FROG! 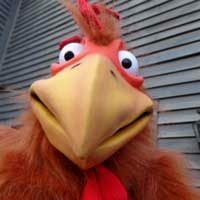 Riley the Rooster forgets to wake up Farmer Fred and the barnyard animals are off on an adventure! Wake up Farmer Fred – the cows & pigs are playing pin the tail on the donkey! Meet Boris, the mixed-up Tyrannosaurus! The children will discover some interesting dinosaur facts, all the while funny magic happens – Boris turns into… NO, it can’t be…BARNEY?? Summer is a time for water play, picnics and BUGS!! Let’s celebrate the summer together! Everybody is different, and everyone is special- that’s the message. Be beautiful on the inside like Candice the Caterpillar. Be the best you can be! Off to the ZOO – It is a big place! Zebras and bears, oh my! Hey, is Gerry the giraffe standing on his head? Such a busy ZOO! Put on your safari hats, adjust your binoculars, and get ready to go on a Silly Safari! Will Ellie the elephant’s disappearing act be good enough to get her on America’s Got Talent? Lots of clowning around under the big top! WOW –it truly is a three ring circus with Harry, the very sneaky lion, and Giggles the clown AND plate-spinning kids -are they looking to join the circus? Red, White & Blue, we love you! Learn about the American Flag with more patriotic fun! 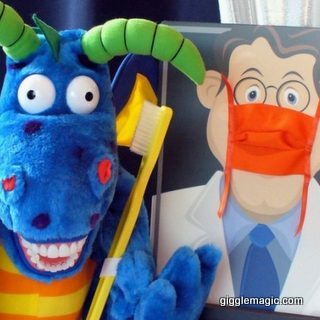 Dental Health Show - Little Bear eats too much sticky honey and visits the dentist, Dr. Tickletooth. He is a friendly guy who loves to count teeth! Little Bear learns about flossing, too! Row, row, row your boat to Treasure Island where Mango the Monkey gets stuck in the treasure chest; Pirate Pete has an eye patch malfunction! Children’s literary classics the Three Little Kittens & Humpty Dumpty are presented with a magical twist! The little kittens may have lost their mittens, but mama cat has LOST HER TAIL! Children give thanks and appreciation for people and things in their daily lives; everything from listening ears to school friends, silly hair, books, music and fun! It’s an everyday lesson! There are crazy critters in my Grandmas house! Marvin the spider takes a new job in web design, and uh, oh…Mr. Bones, the skeleton, has turned into a PUMPKIN!!! Frosty the Snowman can’t find his buttons and is about to have a melt down! 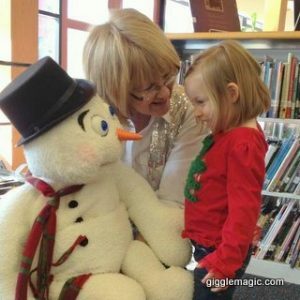 No holiday discussion – just winter fun with a visit from Frosty (puppet) – Olaf’s BFF! Twas the Night Before Christmas and no one was stirring – EXCEPT for one MOUSE! Then Santa’s gets his belly stuck in the chimney as Rudolph paws on the rooftop. Look at his big red nose! For organizations booking a second holiday show – Wrapping presents, trimming trees, should be as easy, as can be…Presents disappearing, ornaments misbehaving! Silly you- silly me! Designed for kindergarten and first grade! Giggle Magic is fantastic! 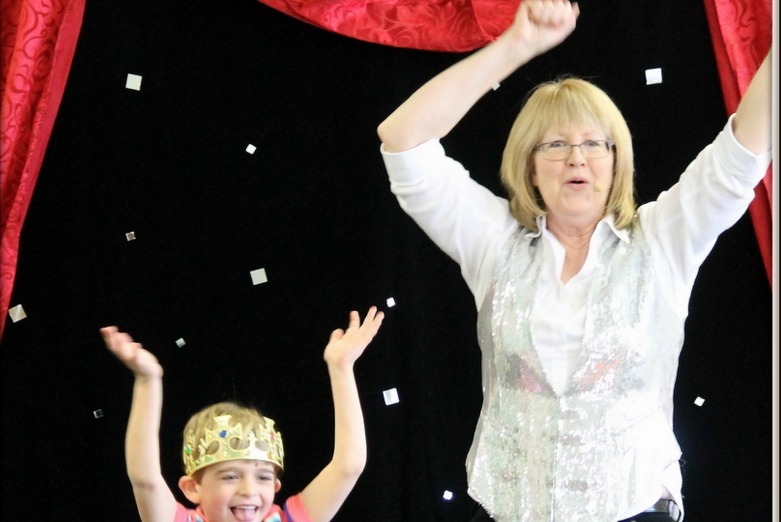 Marcy has kept well over a hundred of our youngest patrons in stitches with her wacky, kid friendly magic show. She intuitively understands what makes young children laugh and knows how to keep them entertained. Parents and children rave about her shows! We love having her come back to the Library to bring out the giggles!" 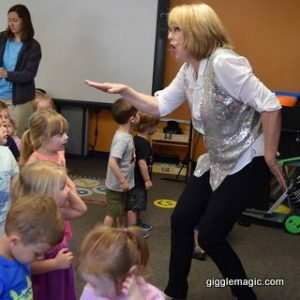 I highly recommend Giggle Magic for any organization that wants a performer specializing in entertainment for young children. Marcy's magic is great for this age group because she performs for their level of understanding, and she holds their interest well. Parents and children always tell me they love her shows. I will continue to use Giggle Magic as much as possible: because I know it will be a wonderful experience for my library families! All 40 students in the room were so engaged, all the teachers sitting in the back were amazed! …your show transformed them from rowdy balls of energy into attentive and gigglers listeners. Thank you for putting such huge smiles on my students’ faces and giving them a morning of laughs that they will remember for a long time to come! Magic Marcy is creative, hands on and just plain fun. Children as young as 2 years of age and up just adore her. They laugh nonstop through the entire presentation!! 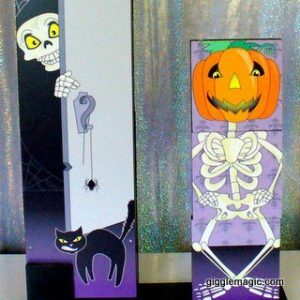 I am writing to let you know how much we enjoyed your Kooky Spooky Magic Halloween Show yesterday! The kids were so engaged and we, the teachers, really enjoyed watching their smiling, laughing faces! It’s a perfect show appropriate for all ages... Thanks so much and we look forward to booking more shows with you in the future. 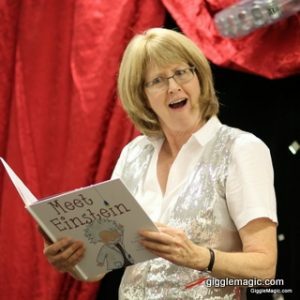 This is the fourth year that the Sinking Spring Public Library audience has requested Marcy and the Giggle Magic Show. 100 kids and 50 adults loved the show!!! Saving a date again for next year! I wanted to send you an email and tell you how wonderful I thought you were with the kids today. And the parents! I found myself rubbing my cheeks by the end of the show; I was smiling and laughing so much. Fewer things make me happier than seeing my kids so happy! I wanted to write and let you know how well received your program was. Last Wednesday we had a great crowd and they enjoyed every moment. I love entertaining young audiences, so much so, that it is the only age group for which I perform! Every day, I am working to improve the Toolbox Kidz and Giggle Magic experience by creating new shows, developing magic props, and adding variety and movement, such as the Kidz-Rock Dance Party. I am a Penn State alum and I regularly attend conferences to keep up with the latest ideas for educational performers. 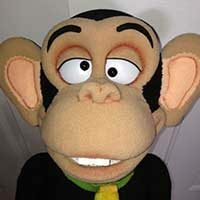 There is PUPPET POWER in Giggle Magic and Toolbox Kidz Shows. Meet the cast! 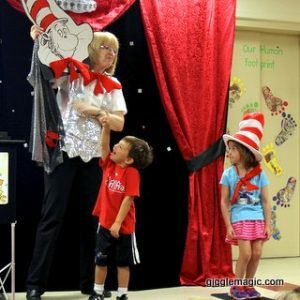 Lancaster County Library Shows - 17 Shows! 2:00 pm, Adamstown Area Library, 3000 North Reading Rd., Adamstown. NOTE: Location of EVENT may change to local Church, which has more space for library programs. Will update when known. Lower Providence Library show on August 7, 2018 at 10:30 am. Zippity Zoo Show! Royersford Library, August 8 at 10:30am! 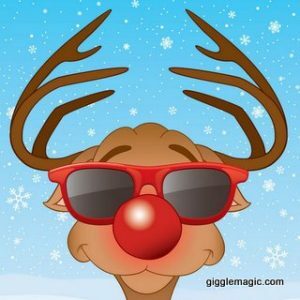 Giggle Magic travels to Montgomery, Berks, Bucks, Chester, Lehigh, Northampton Counties, and to some Philadelphia and New Jersey locations with off-street parking. Set up is best against a wall with an open “stage” area of 10′ x 6′ and within reach of electrical outlet. Nothing else is needed -except giggling kids! No sorry! The elements are not a friend of magic! Do you perform for older students? 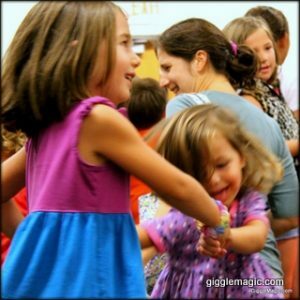 Giggle Magic specialize in entertainment for young children, and their families. Programs are not geared for children in upper elementary grades or adults. Giggle Magic at birthday parties? Sorry, Giggle Magic is no longer performing for weekend birthday parties, but is available for weekday birthday parties held at preschools.